How would I go about doing this, without separating them? Nico is the one I really need to tame. Skittles is used to humans (I got him before adding Nico to my home and worked with him on taming) but it'd be great if I could bond with him a bit more. Taming them will solve so many other problems, such as their diet. So please help! Start by putting your hand in the cage, then wait for them to calm down. Keep your hand in there every day until they no longer fly away. Then hold some millet in your hand and get them comfortable with taking food from you. Once they trust you enough so you can feed them from your hand, put the millet in front of your finger so they have to step onto it to get the treat. Then take them out of the cage while they are eating the millet. Talk to them and let them get used to your voice. Once they can come out of the cage on your finger, you can interact with them in a variety of different ways to build more trust. Trick training is great, as it teaches them to work for a reward, such as a food treat. And when you train them, it builds your bond with the birds without having to touch them or do anything that is uncomfortable for them. I have never had two very bonded birds, so I'm just assuming this will work for all birds. No hand in cage. That belongs to them. Stay out. Her birds don't like to come out, so how is she supposed to tame a bird without putting her hand in the cage? The 'hand in cage' is an old-fashioned technique that is no longer used because it's flooding (it's terribly stressful to the bird, it backfires in the long term and it gives the bird the wrong idea about your relationship with it). And ALL birds come out of the cage. ALL of them without exception. Some will do it as soon as you open the door and some may take months but they all do it. I don't train any of my birds. I don't find it necessary as they all learn without any sessions and end up very obedient. But, if I wanted to tame a parent-raised bird, first I would make it so he is not scared of me by sitting next to the cage (but not looking at him directly, only out of the corner of my eye) and talking, singing, whistling, offering a treat every now and then and just doing my thing (studying, reading, watching TV, playing video games, whatever) to get him used to my presence. When I see that he is perfectly calm when I approach the cage and when I am near it and see that he takes treats from my hand (between the bars of the cage), I would start target training him. 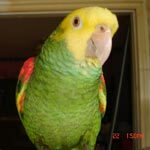 Once he is target trained, I would allow him to come out of his cage about one hour before sunset (this will ensure that, when you put his dinner -seeds- in the cage, he will fly to it). Of course, for this method to work, you can't free-feed high protein food because you need it for rewards AND bait for him to go back into his cage. She said in a separate post that her birds don't come out, no matter how long the cage door is open for. If they are in the cage, the only way to get them to step up is to put your hand in there. Target training is great, but some people's birds just refuse to come out no matter how many treats there are. She said that they never liked being out of the cage even when they were out, that they just hunkered down on their perches like they were scared. I definitely encourage her to target train her birds, but if they refuse to come out, the only way is to put your hand in the cage.